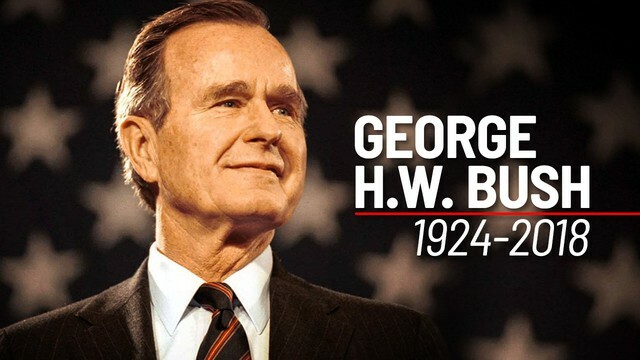 George Herbert Walker Bush, America’s 41st President, will be memorialized on Wednesday in the Nation’s Capital after passing away on November 30 at the age of 94. 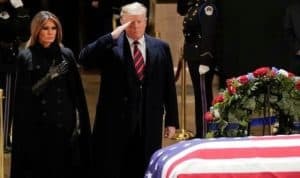 Roads are expected to be closed in the Metropolitan area as the late President is taken to the Washington National Cathedral for a 90-minute funeral. From there, his body will be flown back to Houston and taken in a train with a glass viewing car designed by the late president to his final stop, The George Bush Presidential Library and Museum, where he will be buried on Thursday next to his wife, Barbara, and daughter, Robin, who died at 3 from advanced leukemia. Born in Milton, Massachusetts, on June 12, 1924, George H.W. Bush became the youngest pilot in the Navy after joining the armed forces at 18. He flew in more than 50 World War II Combat Missions and was shot down as a torpedo bomber pilot then rescued from the Pacific by submarine. He was later awarded the Distinguished Flying Cross for bravery in action. In 1945, George married Barbara Pierce, whom he had met as a teenager at a dance, and they eventually had six children. The death of their daughter, Robin, when she was only 3 was known to have greatly impacted the late president for the rest of his life. Granddaughter Jenna Bush Hager shared on Instagram that Bush desired to be reunited with Robin, admitting to her that he used to fear death but no longer did because he hoped to be reunited with loved ones. According to her, Bush would use the phrase “I love you more than tongue can tell” which was spoken by Robin in her short life — “forever knitting Robin’s voice into the tightly woven fabric” of the Bush family. After enrolling at Yale University and becoming a member of the secret society, Skull, and Bones, he graduated in 1948 and moved to Texas where he began a successful career in the oil industry. He soon developed an interest in politics like his father, serving two terms as a Representative to Congress from Texas, as well as an Ambassador to the United Nations, Chief of the U. S. Liaison Office in China, and Director of the C.I.A. Bush became chairman of the Republican National Committee in 1973 as the Watergate scandal was being exposed. He stood by President Richard Nixon from that post until August of 1974 when he joined the calls of many others for Nixon to resign. Bush campaigned for the Republican presidential nomination in 1980 but lost to Ronald Reagan, who then chose Bush as his running mate and eventual Vice President. He secured the nomination in 1988 and began his presidency in 1989, leading an administration which would overthrow the regime of General Manuel Noriega in Panama and send troops to the Gulf War with the vow to free Kuwait from then-Iraqi President Saddam Hussein. Bush signed a pact with Soviet leader Mikhail Gorbachev in 1990 which was representative of a conclusion to the Cold War, as well as treaties which greatly reduced the number of weapons amassed by the superpowers during decades of conflict. He pledged a presidency that would be a “moment rich with promise” in his Inaugural Address but was unseated by Bill Clinton after his first term, bringing his 12 years as President and Vice President to an end. George and Barbara returned to Houston after his presidency and remained active in their community. Bush served on the Texas Medical Center board of directors for over 20 years beginning in 1993. Citing the death of their daughter as a catalyst, the Bushes were passionate about advancing cancer treatment and helped to raise almost $90 million to support oncology research for The University of Texas MD Anderson Cancer Care Center. The former president volunteered at his church and dedicated The George Bush Presidential Library and Museum to Texas A&M University in 1997. Following a tsunami which struck Asia in 2004, he joined with former President Bill Clinton to fundraise for assistance to damaged communities through the Bush-Clinton Houston Tsunami Fund. Barbara Bush died at age 92 on April 17 and preceded her husband in death by only eight months. Their union was strong enough to withstand 73 years, some of which held devastating tragedies and trials such as his wartime deployment and capture, the loss of a very young child, and the demands on the family of his various roles as a politician. In a class note for her college magazine, Smith Alumnae Quarterly, written in March of this year, she proclaimed: “I’m still in love with the man I married.” Theirs is the longest presidential marriage in history. After being hospitalized several times this year following Barbara’s death, Bush said that he did not want to go to the hospital and that he was ready to go be with his wife. His last words were reported to be “I love you” while on a phone call with his son, George W. Bush. Several people were in the room when George Herbert Walker Bush slipped away, including his son and his family and his former Secretary of State.